Lyrics by Ouyang Xiu include, "I raise my wine cup to implore the east wind"
Can use ci lyrics by Su Dongpo that include, "With wine in hand I ask the clear sky"
In 1425 it is an instrumental melody, but the 1585 version added lyrics that can instead be sung with to the 1425 music; Section 1 is entitled "Drinking Friends and Poetic Companions" and the same phrase is used there as lyrics. "琴酒 Qinjiu" is also the Chinese word for "gin". 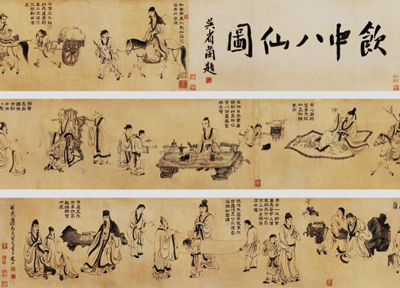 The original of this scroll, by 陳洪綬 Chen Hongshou (1598-1652) is at the National Palace Museum; image copied here from the Digital Archives website. Jiang Yue Bai, 1525, Section 7: "Having goblets of wine, speaking one's feelings"
Si Gui Yin, 1511, ends by singing of "filling jade wine cups"
Gui Qu Lai Ci, 1511, includes a line about a "wine-filled goblet". Ting Qin Fu, 1511, Section 4 includes a line about being "half-intoxicated with wine" (but playing a 箏 zheng). Further searches will undoubtedly find more such references.